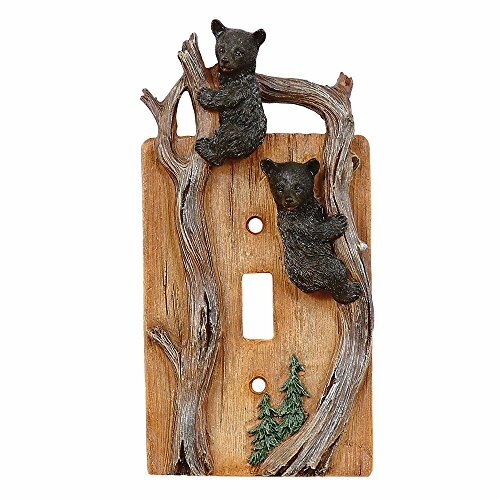 Climbing Bears Single Switch Plate - Wilderness Decor by Black Forest Decor at Elect Forum. MPN: SIX9311. Hurry! Limited time offer. Offer valid only while supplies last. Black Forest Décor is a mail order catalog and internet business that specializes in home décor and lighting products for homes, cabins and lodges. OUTDOOR DESIGN: Our decorative single switch cover has a design sure to please any lover of the country-western style. The design will match any outdoor-themed room, and the decorative style adds a vintage feel to your home. FUNCTIONAL & DURABLE: Our decorative single switch cover conceals the electrical wiring protruding from the outlets in your lodge or cabin. The artwork also gives your lodge or cabin that outdoorsy feel, without sacrificing for style. VERSATILE: The artwork on the switch cover will match any cabin or lodge room. It will make for an excellent addition to your collection and protect people from getting hurt. This single switch cover is sure to match your style, wherever you put it. COURTEOUS SIZE: We offer different sized single switch covers to fit your electrical outlets. At a width of 3 ¼ inches and a height of 5 inches, our Bear Stone Finish Lodge single switch cover makes for a perfect decorative piece for your home.